The Calphalon Tri-Ply Stainless Steel 13-Piece Cookware Set combines 8 useful pots and pans (plus 5 lids) to give you a complete set that can cook up just about anything you can imagine. There are 3 skillets (omelette pans), 2 sauce pans, a sauté pan, a chef’s pan and a stock pot. This cookware set has an aluminum core that is encapsulated by durable stainless steel. Calphalon stainless steel pieces can be used on any cooking surface, including induction stovetops, and is easy to clean whether by hand or in the dishwasher. Read the rest of my in-depth review to learn more about the features of the Calphalon Tri-Ply Stainless Steel Cookware, and find out what other consumers had to set about this product. 8”, 10”, and 12” omelette pans; 1-1/2- and 2-1/2-quart covered sauce pan; 3-quart covered saute pan; 3-quart covered chef’s pan; and 6-quart covered stock pot. Aluminum is a great conductor of heat, and found as the primary metal in many cookware sets. The Calphalon Tri-Ply Stainless Steel 13-Piece Cookware Set starts with a heavy gauge aluminum core that is then surround by two layers of stainless steel. The stainless steel not only looks good, but is also durable and resistant to dings, scratches and dents. The handles are made of stainless steel and are triple riveted. The riveting makes the handles ultra-sturdy and durable. The see through lids are made of tempered glass and have stainless steel handles that are looped high enough to be able to comfortably lift the lids, even with oven mitts on. 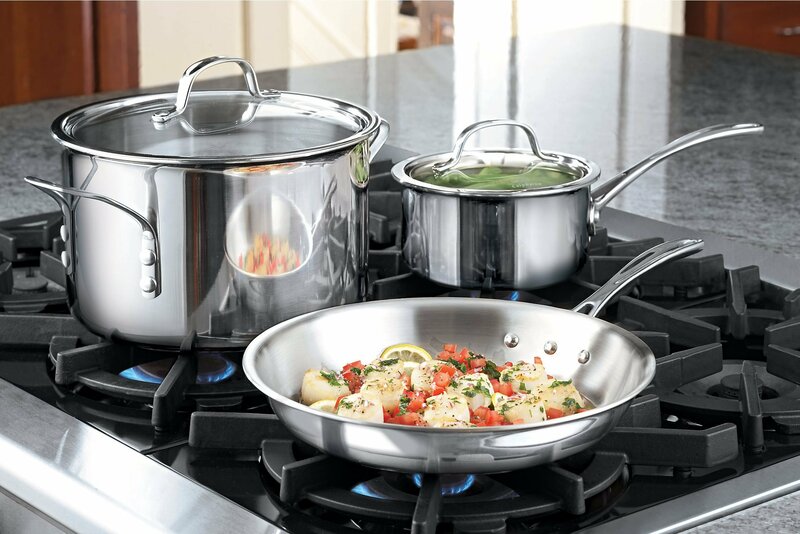 The exterior of the Calphalon Tri-Ply Stainless Steel Cookware is polished to a mirror-like finish and looks very professional. The interior of the pots and pans are satin finished steel. Reviewers have commented that the pots and pans all feel solid, and they have a nice, heavy weight to them. They are heavy enough, in fact, that one consumer recommends not getting this set if heavy pans would be problematic. While some cookware sets seem to be lacking something, the Calphalon Tri-Ply Stainless Steel 13-Piece Cookware Set comes with enough variety in terms of type and size that you aren’t likely to struggle to find one to cook with for nearly any meal. The chef’s pan and large covered sauté will work great for one dish meals, and there are three different sizes of skillets, so whether cooking an egg for one or a whole family, you’ll have a conveniently sized pan. These handles aren’t going anywhere. The handles are long and because they are securely riveted to the pots and pans, they make handling of the pieces secure. One thing to note, however, is that while the manufacturer claims the long, stainless steel handles of the Calphalon Tri-Ply Stainless Steel Cookware stay cool, many reviewers stated that this is not the case. You’ll want to use oven mitts or pot holders just play it safe when handling these pans. It seems like it’s getting harder to find cookware that doesn’t have tempered glass lids. And, for good reason. Having glass lids makes it easy to keep an eye on your food while it’s cooking without disturbing the process. Lifting a lid repeatedly lets moisture and nutrients escape, which can ultimately affect the taste and nutritional value of your food. Glass lids solve this problem nicely by allowing you to see what’s going on in the pan, while keeping heat and moisture locked in. 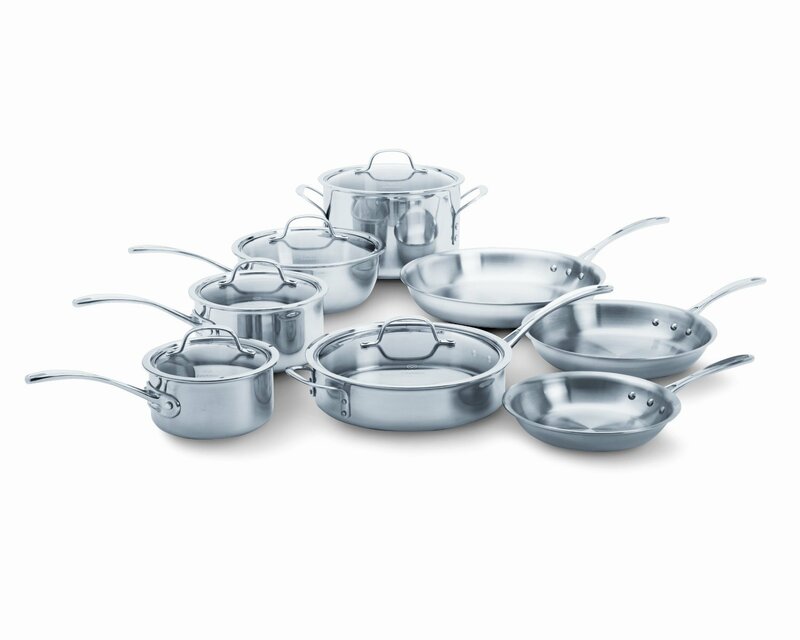 The Calphalon Tri-Ply Stainless Steel 13-Piece Cookware Set is oven safe up to 500 ° F. The glass lids are also oven safe up to 450 ° F.
Calphalon will replace any item found defective in material or workmanship when put to normal household use and cared for according to the instructions. With its stainless steel construction, you can expect the Calphalon Tri-Ply Stainless Steel 13-Pc. Cookware Set to last for many years, if cared for properly. Stainless steel is a naturally tough metal and is resistant to scratching, denting and other types of damage. While the set is dishwasher safe, Calphalon does recommend hand washing to maintain the metal’s lustrous surface. The Calphalon Tri-Ply Stainless Steel 13 Piece cookware set is dishwasher safe; however, that doesn’t mean you should put them in the dishwasher. (Now when have you EVER heard me say that?) Even Calphalon recommends hand-washing the set to maintain the shiny appearance. Cookware reviews on Amazon and the official Calphalon site confirm the durability and quality of this set. One reviewer stated that she has been using the set – and adding to it – for the past 5 years. Another mentioned that while the cost of the set is high, the quality far exceeds the price tag. She thought the set would last long enough that she’d be leaving the set to her children. Yet another consumer said she thought the set would “last forever”. Several reviewers talked about how well the Calphalon Tri-Ply Stainless Steel 13-Pc. Cookware Set works. The pieces all heat evenly and quickly. There is no need to use higher heat temperatures (which isn’t recommended, anyway). They work well in the oven and on any stove top, including induction. While quality and ease of use seemed to be most prevalent on reviewers’ minds, several consumers also took the time to mention how nice the Calphalon Tri-Ply Stainless Steel 13-Piece Cookware Set looks. There were various comments regarding the appearance of the set including “stylish”, “beautiful”, and “looks fabulous”. Perhaps one of the only complaints about this set is that the handles get hot and don’t have a silicon coating. More than just a handful of reviewers pointed out that, despite the manufacturer’s description stating the contrary, the handles do get hot while in use. While silicon handles would make a nice feature, simply using a kitchen towel or pot holder will eliminate any issues with hot handles. Reviewers felt the rest of the features were nice enough that they compensate for any issues with the handles. One of the other complaints seen in comments was that the Calphalon Tri-Ply Stainless Steel 13-Piece Cookware Set can be hard to clean. This is true for almost anyone that isn’t used to cooking with stainless steel. To avoid issues with food sticking on, be sure to follow the manufacturer’s instructions including not using high heat. You’ll want to preheat the pans and use a bit of lard/oil/butter to keep food from sticking. With a little practice, you’ll find that cooking with, and cleaning up, stainless steel isn’t any more difficult than nonstick. Not to mention some experts believe it’s healthier.